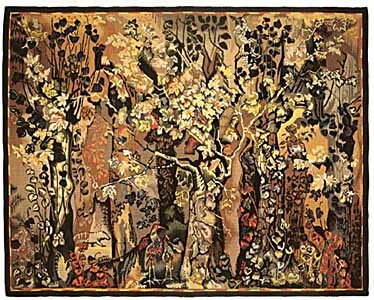 2009 - France's Aubusson tapestry is inscribed on UNESCO's Representative List of the Intangible Cultural Heritage of Humanity. La dame à la Licorne, "A mon seul désir", end of the 15th century. 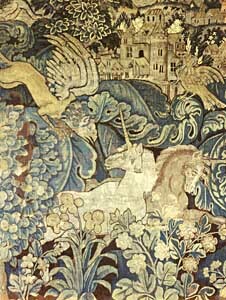 The origins of tapestry remain mysterious. According to the legend, the Saracens, after they were defeated in the Battle of Poitiers in 732, would have settled weaving looms on the banks of the Creuse river. 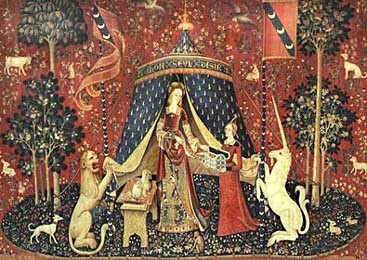 The 15th century witnessed the apparition of mille-fleurs: the backgrounds of tapestries were laden with flower patterns - the most famous example being The Lady and the Unicorn. They were intended as decoration and drew their inspiration from religious and mythological themes, depicting verdure sceneries, animals and characters. 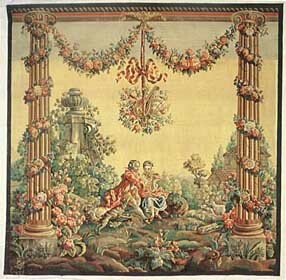 In the 17th century, tapestry enjoyed a remarkable expansion and in 1665, Aubusson was given the status of Royal Manufacture by Colbert. After the French Revolution, the workshops of the county of the Marche lost their status of State Manufactures. Upholstery and machine-made carpets replaced wall tapestry, which was no longer appreciated. Le bestiaire fantastique d'Anglards de Salers, XVIe siècle. Verdure, XVIIe siècle. after a cartoon from the 18th century. 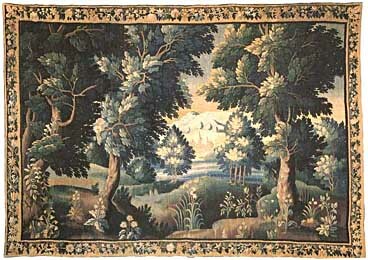 At the end of the 19th century, the creation of the École Nationale des Arts Décoratifs d'Aubusson (Aubusson National School of Decorative Arts) sparked a revival of tapestry through changes in its technique: the painter simplifies the weaving process by limiting the number of colours, while avoiding excessive gradations. However, tapestries were still reproductions of paintings. Only from 1930, with Elie Maingonnat - whose goal was to interest the artists in tapestry -, did painters start to make models exclusively for weaving (Lurçat, Gromaire, Picart-le-Doux, Saint-Saëns...). 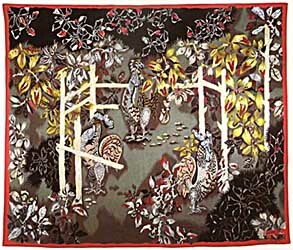 Jardin des coqs, 1939, Jean Lurçat . L'automne, 1940, Elie Maingonnat . The whole site, pictures, texts and animations, is © J.M. Lartigaud.